A new report released Thursday says that the office of the constable is "outdated and irrelevant as an arm of law enforcement and poses potential liabilities for counties." The report was commissioned by the Kentucky Justice and Public Safety Secretary, J. Michael Brown after several high-profile incidents occurred involving constables in the state over the past year. Constables used to be vital members of law enforcement in many rural places, but over time other agencies took on their duties and the role of constables became blurred, Wendy Mitchell of The Ledger Independent in Maysville, Ky., reports. The report, "Constables in Kentucky: Contemporary Issues and Finding Surrounding an Outdated Office," was a six-month review that included historical perspectives of the constable, and other states' experience with the office. Constable duties in the commonwealth have been handled in different ways in different counties. In the Buffalo Trace region, Bracken County Fiscal Court members put restrictions on constable use of police style lights and radio communications. They also required the five county constables to post their own bond. In nearby Lewis County, however, constables often accompany police when asked and patrol rural areas. The report says that "an overwhelming majority of county and law enforcement officials see little to no practical purpose behind the constitutional office, and believe it should be abolished or its law enforcement authority eliminated or restricted," Mitchell writes. Constables have no formal training, education or experience before being elected to the position, the report says. This is inconsistent with Peace Officer Professional Standards, which require pre-employment standards. Those almost 60 million Americans who live in rural America do not have as much ready access to health care or to the vast number of health care providers than those who live in more urbanized America. Rural Americans are more likely to arrive on the doorstep of health care facilities without insurance, and that number is growing. These challenges and more have prompted the National Organization of State Offices of Rural Health (NOSORH) to designate Thursday, Nov. 15 as National Rural Health Day. The day, explains NOSORH director Teryl Eisinger, is an effort to increase awareness of rural health-related issues. The event has stretched to a week of activities, celebrations and a daily webinar series on rural health-care issues accessible to anyone interested nationwide. Here's a schedule of free webinars. All times are Eastern Standard. Monday, Nov. 12, 3-4 p.m., Basics of Rural Health, with Kristine Sande, program director, Rural Assistance Center; Rebecca David, executive director, National Cooperation of Health Networks; Mike Shimmens, executive director, Rural Recruitment and Retention Network. Tuesday, Nov. 13, 1-2 p.m., Cultural Awareness While Serving Rural Veterans with Jay H. Shore, MPH, Associate Professor, University of Colorado, Denver. Wednesday, Nov. 14, 2:30-3:15 p.m., Health Resources and Services Administration Rural Health Update with Mary Wakefield, HRSA administrator. Friday, Nov. 16, 3 p.m. Looking Towards the Future of Rural Health Care with Randall Longenecker, MD, Rural Training Track Technical Assistance Program and Jim DeTienne, Montana EMS and Trauma Systems. Though drought in the Midwest seems to be easing, drought in the Great Plains continues to deepen, according to the most recent U.S. Department of Agriculture Drought Monitor. 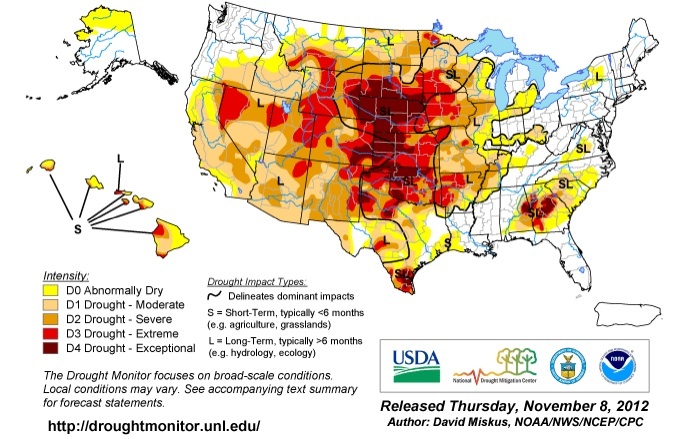 Texas, Oklahoma, Kansas and Nebraska all saw drought expansion, which is hindering growth of the new winter wheat crop in those states. Livestock grazing was also poor. The Center for Rural Affairs is hosting a farming webinar for U.S. veterans. Veterans have become disproportionately rural, and many return home to places where jobs are scarce, the Center's Wyatt Fraas said. The webinar is meant to energize rural veterans to begin farming and hopefully take over for aging farmers and ranchers some day. "The Center for Rural Affairs’ Veteran Farmers Project provides veterans with the knowledge to become successful farmers and ranchers. By creating sound farm and ranch businesses that tap into high value markets, returning veterans can reintegrate gracefully and fruitfully into America’s rural communities," a press release states. The webinar is free and features video farm tours and discussion with farmers and ranchers. It will also focus on financing, land access, disability assistance and other farming resources for veterans. The webinar will be Nov. 16 from 8 to 9:30 p.m. EST. For more information, click here. Reduced hours at almost 500 post offices will start Nov. 17. 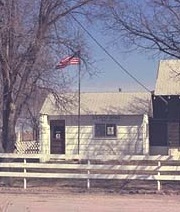 Between Jan. 12, 2013 and February 9, about 1,100 more post offices will see reduced hours. The remainder of the first-phase offices will reduce hours from February and April, Hutkins reports. About 1,500 offices that didn't have a postmaster when the USPS announced its POstPlan in May are included in the first phase of implementation. About 700 offices without a postmaster have yet to be scheduled for review by the USPS, and are thought to be prime targets. About 4,000 of the first-phase offices had a postmaster before the plan was announced, and about half of them likely accepted a retirement incentive, and the other half probably took a job elsewhere in the service, Hutkins writes. He says those numbers are only be estimates because the USPS hasn't released the number of postmasters who accepted the retirement incentive. Industry may dial down 'war on coal' rhetoric, but what will a re-elected Obama do with regulations? The coal industry will consider toning down the "war on coal" rhetoric used by Republicans in the presidential race and several close congressional contests but will continue to fight the environmental regulations to which the phrase refers, Ken Ward Jr. of The Charleston Gazette reports. Political leaders in Central Appalachia told Ward they "hold out some hope" that the administration might be open to easing Environmental Protection Agency permit reviews and revising new air-quality standards. But experts said that is unlikely, and that the administration may even focus more attention on reducing coal mining's impact on the environment and communities, and reducing air pollution from coal-fired power plants over the next four years. "I think the election returns may embolden Obama on a number of fronts, including a more determined effort to shift black to green on energy," Vermont Law School environmental policy instructor Pat Parenteau told Ward. "He certainly doesn't owe the coal industry or coal-state politicians anything." Sinclair Broadcast Group, a company that owns 74 TV stations, many of them with large rural audiences, aired what critics say was a biased election special in battleground states Monday night. The half-hour broadcast, shown on at least three stations in Ohio and Florida, is being called a partisan attack on President Obama. Sinclair was criticized in 2004 for planning to air a documentary it made attacking Democratic presidential nominee John Kerry. ABC affiliate WSYX in Columbus aired the specials, "which included content prepared by their corporate parent company," twice during times when national news programs were scheduled, Eric Lach of Talking Points Memo reports. 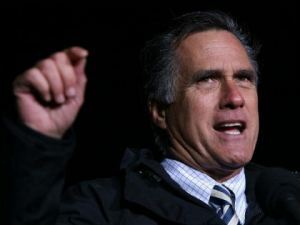 The programs did include some favorable comments about Obama, but the criticism of him was "elevated, while Mitt Romney seemed to escape the bulk of the attention," Lach writes. He says segments about health-care reform, the economy and foreign policy seemed to lean toward Republican views on the issues. Similar scripts were used for specials on WRGT in Dayton and WPEC in West Palm Beach, Fla. Merrill Knox of TVSpy reports. WSYX and WRGT employees told Lach that the content was prepared by Sinclair and sent to them to be aired. To watch the entire WPEC broadcast, which is very similar to the other two broadcasts, click here. Shirley Sherrod, who was the first African American appointed to lead Rural Development in Georgia for the U.S. Department of Agriculture and who was very publicly fired just 13 months later, has written a memoir about her experience. 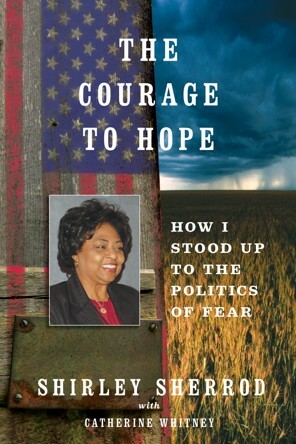 In the book, The Courage to Hope: How I Stood up to the Politics of Fear, Sherrod does not cast President Obama, Agriculture Secretary Tom Vilsack and then-Deputy Undersecretary for Rural Development Cheryl Cook as heroes, Agri-Pulse reports. Sherrod was appointed in 2009, and fired 13 months later after a conservative blogger released a small portion of a speech to an NAACP chapter in which it seemed to be bragging about turning away a white farmer who needed help. As it turns out, Sherrod was talking about an incident that occurred 23 years before her appointment, and the rest of the clip revealed that she turned the farmer away to refer him to a white lawyer thinking that would be more beneficial for him. When that lawyer didn't help him, she did. "The most powerful portion of Sherrod's new memoir . . . fleshes out the story she sketched in her NAACP speech," Kevin Boyle of The Washington Post reports. He writes that Sherrod's activism was born out of her childhood on a farm in southern Georgia in the dying days of Jim Crow. After her father was murdered by a white neighbor when she was 17, her family began participating in civil rights marches. She has spent more than two decades working on behalf of rural poor, both black and white, Boyle writes. In The Courage to Hope, Sherrod does fault Obama, Vilsack and Cook for "failing to try to learn the whole story . . . before Vilsack ordered her fired," Agri-Pulse reports. But she is not bitter about the situation. Instead, her sharpest criticism is for the blogger, Glenn Beck and Fox News for "piling on the story," and Iowa Republican Rep. Steve King for trying to block financial settlements with black farmers who were denied USDA loans over the years, Agri-Pulse reports. Sherrod writes about her experience with racism in the South and the episode that ultimately drove her from public service. "Mostly, she is saddened by how Vilsack handled the affair, from the July 2010 firing that she describes as 'hasty and cowardly,' to his offer to her to become deputy director of a new Office of Advocacy and Outreach," Agri-Pulse writes. She refused Vilsack's offer. "His kind words and praise felt hollow to me," Sherrod writes. Agir-Pulse is subscription-only, but a four-week free trial can be accessed here. Mitt Romney won 59 percent of the rural vote yesterday, according to exit poll results reported by CNN and other news outlets. That was five percentage points better than John McCain in 2008 and even beat George W. Bush's 2004 percentage by two points, but did not quite equal Bush's 2000 share of 61 percent. 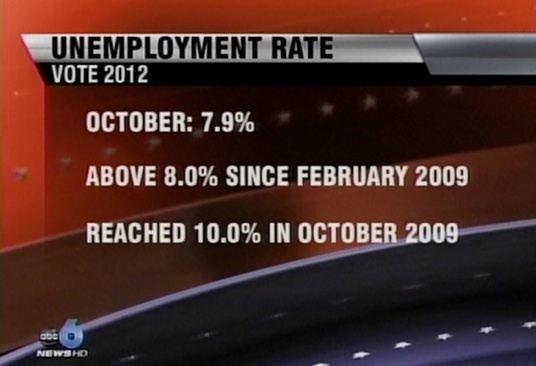 Romney's rural performance reversed a decline in Republican presidential nominees' performance among rural voters. That hit a low of 49 percent in 1996, when Bill Clinton was re-elected, but zoomed upward when his vice president, Al Gore, tried to succeed him. For a graph and short story from the Daily Yonder, click here. Just a few decades ago, Appalachian coal miners fought battles with mine operators for worker's rights, mainly better pay and safety. They were bitter rivals in a real war that looks nothing like the so-called "war on coal" of today's politics, which has led voters in a congressional district well outside coal country to elect a candidate who mostly ran on a pro-coal ticket: Republican Andy Barr, right, of the state's 6th Congressional District, which comprises most of the famed Bluegrass Region. In today's Eastern Kentucky, miners and their relatives and friends have joined with operators in response the "war on coal" that they have been told was started by the Obama administration to end coal mining as the state has known it for more than a century. Kentucky is the third largest producer of coal in the U.S., and the industry remains a major player in the state's politics. Many people outside the Eastern coalfields have sympathy for the industry's and miners' perceived plight, said Al Cross, director of the University of Kentucky's Institute for Rural Journalism and Community Issues, which publishes The Rural Blog. Cross wrote in a column for The Courier-Journal of Louisville in October that Barr and his coal industry allies were trying to unseat Democratic incumbent Ben Chandler "by telling lies" about the "war on coal." Barr's campaign ran a television ad featuring a Western Kentucky coal executive posing as a miner, proclaiming that Chandler and President Obama were attacking the coal industry. The man still has his miner's certificates, but "Barr's ad was misleading to the point of untruth," Cross wrote. "In the longstanding language of coal mining in Kentucky, there are miners and there are operators, and executives belong in the latter category." When Chandler ran an ad calling Barr's spot "a big lie," Barr ran one in which the executive said Chandler was attacking him, and another in which miners denigrated Chandler, one calling him "a low-life." The basis for the ads was Chandler's vote for Obama's 2009 cap-and-trade bill, opposed by the coal industry and electric utilities. Thus did Barr and his allies use Kentucky's long-standing relationship and history with coal to play on the sympathies of 6th District voters and associate Chandler with President Obama, whom Chandler said afterward "was just a little too heavy for us in some of the rural counties." Cross wrote in his pre-election column, "The race is less about Obama than coal, which is not mined in the district but seems to have more friends there than Chandler may have thought." 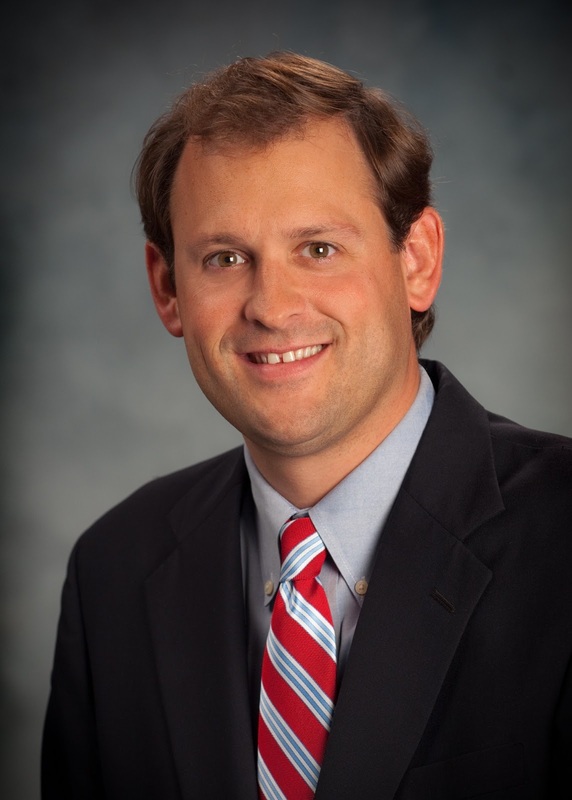 To help Chandler after his 648-vote win over Barr last time, the state legislature made his district more Democratic, but the new counties were close to or even in the Appalachian coalfield, and he lost every one of them. For coverage from the Lexington Herald-Leader, click here. "It's interesting that the origin is a verb and not a noun, a term that implies action and duty, rather than merely a stance," Manning writes. He notes that he qualifies as a conservative because his goal on the 20- acre farm he owns is to "preserve the character and health of this land." He doesn't use chemicals, he plants gardens on a "few patches of level ground" and rebuilds the soil with compost and leaves in the fall. He says he learned ethics of hard work and preservation of the land from his grandfather. He learned rainwater-catching techniques that helped him through this summer's drought from his great-grandparents and great-great aunt. Kentucky's most famous community journalist has completed his second memoir, this time focusing more on his journalism and the state's public figures than on his life and victory over alcoholism. 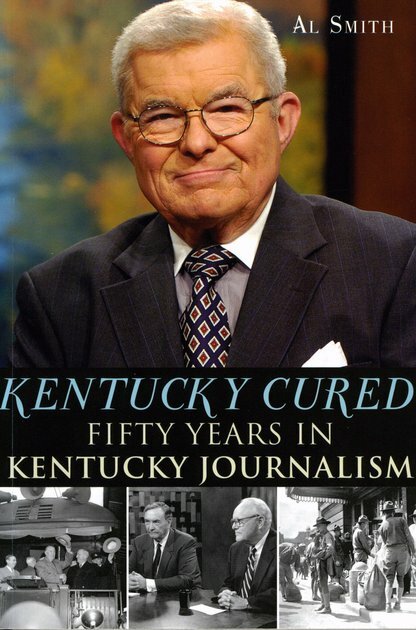 Al Smith's Kentucky Cured: Fifty Years in Kentucky Journalism (History Press, $19.95) is on bookshelves now. The book "says a lot more about Kentucky than it does about Al Smith," writes Tom Eblen of the Lexington Herald-Leader. The book is a collection of new and updated essays, many first published in the Herald-Leader or The Courier-Journal of Louisville. But most of them are about "some of Kentucky's most fascinating public figures of the second half of the 20th Century," Eblen writes. "Smith got to know them all, and many more, during his varied career." Stories in the book are about many familiar Kentucky names: Gov.s Albert B. "Happy" Chandler, Bert Combs, Louie Nunn, Edward "Ned" Breathitt and Earle Clements; political figures Ed Prichard, Georgia Powers, Larry Forgy and Gatewood Galbraith; writers Robert Penn Warren and John Ed Pearce, and "the crafty politician/educators who transformed Kentucky's state 'teacher colleges' into dynamic regional universities," Eblen writes. Author Don McNay writes in the Huffington Post that Smith's book is a "must-read for students of Kentucky history, journalism and politics," and calls it "the book that I thought Smith would write as his autobiography." It's "loaded with insight about Kentucky and Kentuckians," he says. Where Smith's first book, Wordsmith, was "raw" and dark, Kentucky Cured "reflects the upbeat, spellbinding and positive side of Smith's personality, laced with colorful characters, both well-known and unknown," McNay writes. "Kentucky Cured by legendary Kentucky journalist Al Smith is the book his followers, fans and friends wanted," writes journalist Ferrell Wellman, who succeeded Smith as host of Kentucky Educational Television's "Comment on Kentucky," which Smith co-founded (as well as the Institute for Rural Journalism and Community Issues, which publishes The Rural Blog). In his first book, Wordsmith, Smith wasn't as honest about his encounters and impressions of the powerful and rich-and-famous whom he's met over the years, Wellman writes, but the new book "corrects that, and is proof, at 85, Smith can still bite when he turns a phrase." He lauds the state's political leaders' accomplishments, but is also critical about their lives and careers. Smith writes in Kentucky Cured: "In a state like Kentucky, leadership often falls to political hacks or fresh faces with painless promises, which fail." 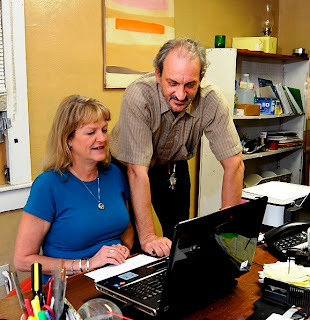 The award is named for the couple who published The Mountain Eagle in Whitesburg, Ky., for more than 50 years. Tom Gish, who died in 2008, and his wife Pat were the first recipients of the award. “The Austins showed courage in starting a second newspaper in a one-newspaper town, in January 2011, then demonstrated courage, tenacity and integrity by reporting on local corruption,” Institute Director Al Cross said. The weekly paper reported in its first edition about a state investigation of vote-fraud allegations, then analyzed records obtained from investigators to report that the county had an unusually high number of absentee ballots, many of which were witnessed by employees of the county sheriff’s department and cast by criminal defendants, some of whose charges were soon dropped. The paper also revealed that the county's chief deputy, the arresting officer in several cases in which the suspects immediately voted and were given leniency, was also pawning county-owned guns for personal gain. He has resigned and pleaded guilty to failing to discharge his duties. The vote-fraud investigation continues. For a story about the Austins from the Asheville Citizen-Times, click here. 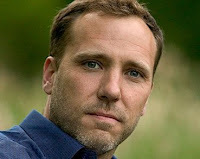 "Last Tuesday, the Romney campaign made its first ad buy this state, making a play for votes in western Pennsylvania in particular by casting the Obama administration’s energy policies as “crush[ing]” Pennsylvanians and touting Romney’s “different” energy plan (quoting Romney’s “I like coal” line from the first presidential debate)," Knelly reports. "The Republican National Committee and pro-Romney super PACs Restore our Future and Americans for Job Security have also poured several million dollars into ad buys here over the past week, totaling nearly $12 million from Romney and supporting super PACs and $1.6 million from the Obama camp." 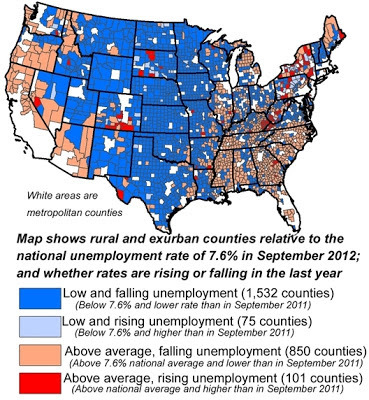 Unemployment in America's rural counties in September was 7.4 percent, lower than at any time in the last four years, according to Bureau of Labor Statistics data. 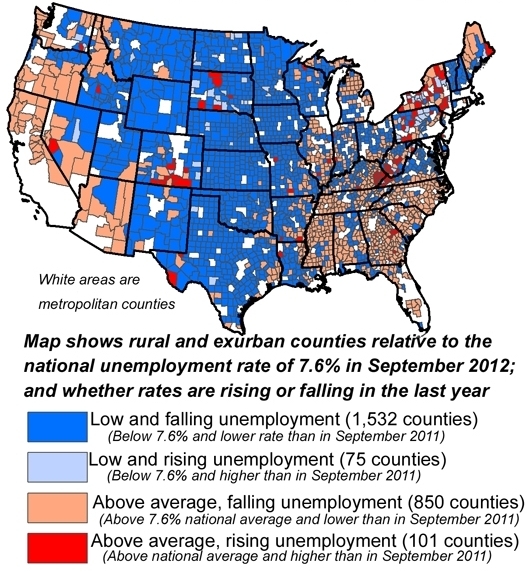 "The last time the BLS found unemployment that low in rural America was in November of 2008, when rates stood at 6.7 percent," Bill Bishop reports for the Daily Yonder. "While many American manufacturers outsourced their work to low wage, overseas locations, Marr Valve Company kept it rural" in Grantite Falls, Minn., reports Tom Cherveny of the West Central Tribune in nearby Willmar. 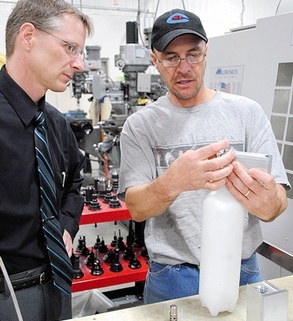 "A skilled, rural workforce and high-tech manufacturing equipment provide the advantage," he writes, citing the company's operations manager, Cheryl Monson. "Many of the component parts that are machined and assembled into valves and regulators at this site could be made in assembly line fashion by low wage workers," Cherveny reports. "But turn the drudgery over to computer-driven machines, costing anywhere from $150,000 to as much as $500,000 a pop, and you get a higher quality product. They machine the parts with a precision no human could manage." Under the Patient Protection and Affordable Care Act, Medicaid expansion is mostly left up to state governments, making "the choices voters make to fill governor's mansions and state legislatures" decisions that will have "just as big an effect on what kind of health coverage they will have in coming years," Maggie Fox of NBC News reports. Two states are at the extremes of the debate: Texas, which has "free-market, bare-bones" health care, and Vermont, "which is unabashedly going for a European-style, government-supported system," Fox reports. There are 6.3 million people in Texas without health insurance, which is about a quarter of the state's population, giving it the highest percentage of uninsured in the U.S. Gov. Rick Perry has said he won't expand Medicaid, despite heavy federal incentives, and the Republican-dominated state legislature turned down $76 billion in matching federal funds that would have helped expand coverage. In Vermont, Democratic Gov. Peter Shumlin and the legislature want a "single-payer system that they say will give them the leverage to lower prices and provide better care for everyone in the state," Fox reports. But they don't yet have the votes to make this happen. This year's state election will decide in which direction health care moves. Children living in rural areas are 20 to 50 percent more likely than their urban counterparts to be obese. Researchers in at least one state are trying to find out why, and are looking for ways to change the statistic. The Oregon State University Extension Service is launching a three-year study with the help of children in two rural school districts, reports Shelby King of the Herald and News in Klamath Falls. The study could have implications for rural communities across the U.S.
For the first time in decades, climate change wasn't mentioned in any of the three presidential debates, even though a recent Pew Research Center poll says that 42 percent of Americans now believe that global warming is "mostly caused by human activity," a sharp increase from five years ago. 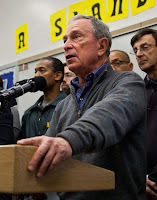 Now, Hurricane Sandy has thrust the issue into the election, though it has yet to be raised by the leading candidates. None of this discussion will help the Central Appalachian coal industry, no matter who wins, writes Ken Ward Jr. of The Charleston Gazette. Some coal enthusiasts say the defeat of Obama is the cure to the industry's ills, but industry experts and some of mining's biggest advocates agree: "Challenges facing the Appalachian coal industry are much broader and complicated than one election can solve," Ward reports. Competition from cheap natural gas and other coal reserves in the West, the mining-out of the region's easiest-to-reach coal seams and added pressure to reduce carbon-dioxide emissions are adding up to reduce Appalachian coal's future viability, Ward notes. "Thinking that all of these things will simply go away if Gov. Romney wins is delusional and does a disservice to the industry and those who work in it," United Mine Workers spokesperson Phil Smith told him. The UMW, which endorsed Obama in 2008, did not this time, apparently following strong anti-Obama sentiment among miners. The federal government removed wolves from the endangered species list last year, and since then mostly Western state governments have devised plans to reduce what they see as oversized wolf populations within their borders. Now Wisconsin's newly minted wolf-hunting season is in its third week, and Minnesota is scheduled to start its first wolf season this weekend. But opponents say these and similar measures could reverse at least 40 years of work to restore Western wolf populations. 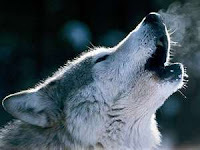 Wolves have been causing problems again for ranchers, prompting the hunting seasons, Steven Yaccino of The New York Times reports. Wisconsin awarded 1,160 wolf-hunting permits and capped the harvest at 201 kills, or about a quarter of its wolf population. There are 3,600 licenses available in Minnesota, which would allow 400 wolves to be killed. That would reduce the state's wolf population by about 15 percent. Animal-rights groups argue the kill quotas don't account for other ways wolves can die, including poaching, and killings by ranchers protecting their herds. They say those additional causes of death could put wolves back at risk of extinction.